I pass by this place all the time while traveling Route 23, on the East side of Windham. 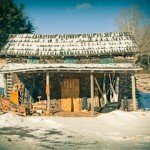 Apart from the really cool buildings made of split wood on the property, the owner is also a wood carver. However this guy exchanged his pocket knife for a chainsaw. He primarily make bears – Yes there are Black Bears up in these parts and I’ve been fortunate to see them several times. But I’m sure this creative guy could make anything out of wood – Just check out the motorcycle on the left……. So I guess I had wood carving on the brain today and was inspired to stop today and take a few photos…. This entry was posted on Tuesday, January 11th, 2011 at 2:57 am. It is filed under The Daily. You can follow any responses to this entry through the RSS 2.0 feed. Couldn’t open from work. Very cool. I remember a place in the mnts of WA where there were chainsaw carvers. Of course I also left a nice large orca in Sedro Wooley that was made by a Swinomish fellow. Given my “office” job and expectations of gentlemeness, I’ve really been drawn to the traditional slip joint folders, like the 3 blade stockman. Stag and jigged bone handles have a new found beauty for me, and after all are really all I need to open mail, slice tape and cut loose threads. More than anything, at roughly 3.5. inches,and of thin design, they make great fidgeting toys. Certainly way cooler than pens. I can twist and twirl it all through a meeting or briefing without scaring anyone. Besides, the shape of the hande and blade shape are really exceptional. No wonder the design has lasted. Large blades really are awkward for anything but very big needs. The Kershaw Double-Cross has become one of my favoites these days. Wharncliffe’s and sheepfoots have more daily use for me than clip point or hunting drop points (which I always carried). Cool pics!